El territorio español, deplorablemente, ha sido estos años pionero y campo de pruebas de los cultivos transgénicos en la Unión Europea y la población agraria esta sufriendo presiones constantes (y falsas promesas), para que sus campos se llenen de variedades transgénicas, destruyendo así el modelo de agricultura que la sociedad les esta demandando. WASHINGTON - The U.S. Food and Drug Administration (FDA) is expected later this week to release a preliminary safety assessment that clears the way for marketing of meat and dairy products from cloned animals for human consumption. The assessment and the agency's expected endorsement of cloned food comes despite widespread concern among scientists and food safety advocates over the safety of such products. The move to market cloned milk and meat also flies in the face of dairy and food industry concern and recent consumer opinion polls showing that most Americans do not want these experimental foods. "Instead of doing its job, the Bush FDA has ignored the science and fast-tracked this decision for the benefit of a few cloning companies,"said Joseph Mendelson, Legal Director for the Center for Food Safety (CFS). "This is a lose-lose situation for consumers and the dairy industry." The FDA action follows the recent news that the agency has refused to investigate health problems in animal clones on a U.S. dairy farm. Greg Wiles, whose Williamsport Maryland "Futuraland 2020"dairy was the first farm in the nation to have cloned cows, told FDA that one of his two cow clones was suffering from unexplained health problems. Wiles told Food Chemical News that the clone "just stopped growing...she just looks terrible," but says that when he reported the problems to FDA and other federal officials, he was "paddled around like a tennis ball from agency to agency. "CFS has asked the Agriculture Department to intervene in the case to stop any sale and prohibit the slaughter of clones and their progeny for food. In October, CFS, joined by a coalition of consumer, environmental and animal welfare organizations, filed a legal petition with the FDA seeking a moratorium on foods produced from cloned animals and establishment of mandatory rules for pre-market food safety and environmental review of cloned foods (see the petition HERE). The petition also requested that the Department of Health and Human Services establish a federal review committee to advise FDA on the ethical issues raised by animal cloning. Recent opinion polls also show that Americans are overwhelmingly concerned about animal cloning for food production. A November 2006 food industry poll conducted by the International Food Information Council showed that 58% of Americans surveyed would be unlikely to buy meat or milk from animal clones even if FDA found such products to be safe. In the same poll, only 16% of Americans had a favorable opinion of animal cloning. A December 2006 poll by the Pew Initiative found that 64% of those polled were uncomfortable with animal cloning, with 43% saying that cloned food is unsafe, while another 36% felt unsure about cloned food safety. The FDA's action also follows growing opposition to the use of clones and their progeny for food products on Capitol Hill. In November, Senator Barbara Mikulski sent a letter to the FDA requesting a complete overview of how the agency came to its decision of using clones in food. In early December, a bi-partisan group of seven senators led by Senator Patrick Leahy asked FDA to reconsider its assessment of cloned animals. The International Dairy Foods Association, representing major dairies and food makers including Kraft, Nestle and others, also has opposed allowing products from cloned animals into the food supply at this time. * Cloning commonly results in high failure rates and defects such as intestinal blockages; diabetes; shortened tendons; deformed feet; weakened immune systems; dysfunctional hearts, brains, livers, and kidneys; respiratory distress; and circulatory problems. "There is widespread concern among Americans, and scientific concern that cloned food may not be safe and that cloning will increase animal cruelty,"said Mendelson. "We intend to pursue our legal action to compel FDA to address the many unanswered questions around cloned food." GM WATCH COMMENT: According to this Associated Press piece, the US government is expected to declare today that cloned animals are safe to go into the human food supply. There has, of course, been no public debate about whether US citizens, let alone the recipients of US exports, wish to consume milk and meat from cloned animals. And this isn't just an issue of democratic deficit. A spokesman for the Biotechnology Industry Organization is quoted in the article as saying, "We clone an animal because we want a genetic twin of that animal. It's not a genetically engineered animal; no genes have been changed or moved or deleted." But we know clones are very far indeed from perfect copies and that all clones are, in one way or another, defective with multiple flaws embedded in their genomes. Rudolf Jaenisch, a geneticist at the Massachusetts Institute of Technology, estimates that something like 4-5% of the genes in a cloned animal's genome are expressed incorrectly. And these genetic defects can have tangible results - some subtle and hard to reckon but others all too clear. Some clones have been born with incomplete body walls or with abnormalities in their hearts, kidneys or brain function, or have suffered problems like "adult clone sudden death syndrome" and premature ageing. Quite apart from the uncertainties, and any health concerns, the defects of clones may pose for consumers, people might well wish to avoid the products of a process that is so disastrous for animal welfare. But, as with GM, they won't be given the choice - food from clones will not be labelled. From rogue GMOs in your rice to pharmaceuticals in your corn flakes, to cloned beef in your burger, America's food chain is shaping up as the world's most exotic. EXTRACT: "Consumers are going to be having a product that has potential safety issues and has a whole load of ethical issues tied to it, without any labeling," said Joseph Mendelson, legal director of the Center for Food Safety. The consumer federation will ask food companies and supermarkets to refuse to sell food from clones, she said. "Meat and milk from cloned animals have no benefit for consumers, and consumers don't want them in their foods," Foreman said. How often do you eat food containing genetically engineered ingredients? It’s really very hard to know! Although it’s estimated that at least 70 percent of food in the U.S. has genetically engineered ingredients, concerns about this untested technology in our meals and snacks aren’t often seen in the mainstream media. And, unfortunately, organic doesn’t always mean non-GMOs. At the Biotechnology Project of the Institute for Social Ecology, we are continuing our grassroots work to educate and organize locally and regionally about the implications of genetic engineering. We are working with people in communities throughout Vermont and the Northeast to raise awareness, pass resolutions, organize events, and pressure corporations. In November we held an intensive strategy meeting of GMO activists from all over the Northeast, resulting in the formation of four regional working groups; please let us know if you want to participate! Next May, the biotechnology industry is bringing their huge annual convention back to Boston and we’re working to create a colorful and informative grassroots response. Here in Vermont, we’re proud of our new Youth Media for Sustainable Agriculture program, working with high school students to learn the issues and produce documentaries that are showing on public access TV stations around Vermont. § Combinations of genetic traits that have never existed in nature before are now in our foods. § If GE foods are used before we understand the long-term consequences, we can’t put the "genie" back in the bottle because pollen is alive and cross-pollinates, making it difficult to contain. § Consumers and farmers are very concerned about genetically engineered foods. Please give generously to support the Biotechnology Project and our Youth Media program. Just go to our website and click on "Donate Now" right on the Youth Media page. Please consider making a tax-deductible donation for $35, $50 or $100. If you contribute $50 or more, we’ll send you one of our short overview videos from the Youth Media program on DVD. You can also earmark your donation for any of our other program activities. All of us at the ISE—staff and volunteers—greatly appreciate your support! On November 9th Roberto Requião, Governor of the state of Paraná, dealt a blow to agribusiness when he signed a decree to expropriate the experimental test site owned by the Swiss multinational corporation Syngenta, located in Santa Tereza do Oeste. The decree was made in the public interest because Syngenta illegally planted 12 hectares of genetically-modified (GM) soybeans at the site. The decree is unprecedented in Brazil and Latin America (indeed, the world), as never before has any state or the federal government moved to expropriate land from an agribusiness multinational corporation. The decree to expropriate the site came after an eight-month, non-violent occupation of the site by members of the rural social movements the Via Campesina and the Movement of the Landless Rural Workers (MST), which occupied the site on March 14th after the Brazilian Institute for the Environment and Natural Resources (IBAMA), the federal environmental agency, confirmed that Syngenta had illegally planted GM soybeans there. While GM soy is legal in Brazil , Syngenta's planting was illegal because the experimental site is located within the protective boundary zone of the Iguaçu National Park , which was declared the Patrimony of Humanity by the United Nations Educational, Scientific and Cultural Organization in 1986. "This is really a historic moment in the global struggle against transgenics, and it is proof that the social movements can control the actions of transnationals," says Maria Rita Reis, an attorney for Terra de Direitos, a human rights organization in Curitiba representing the legal proceedings against Syngenta. According to Roberto Baggio, state leader of the Via Campesina and the MST, "The conquest of Syngenta was only possible through a large alliance of the rural social movements…in alliance with a firm and courageous position of Governor Requião, in the defense of a diversified, national agriculture that preserves biodiversity. This action is a referential international mark in the struggle against the powerful interests of the agribusiness transnationals that want to dominate global agriculture and impose their project, but here in Paraná there are strong signals of popular resistance, which should stimulate militancy to combat the transnationals all over the planet." João Pedro Stedile, of the national coordination of the MST says, "Governor Requião had a courageous attitude to fulfill the constitution of the state to protect natural resources… I hope that other state governors and the federal government will follow in [Requião's] example, and help us to defend Brazilian biodiversity, and the struggle for food sovereignty, and against the transnationals that want to control the food and biodiversity throughout the world." It is likely that Syngenta will appeal the decision in federal courts. Brazil is currently experiencing an economic boom from agricultural production, especially from the production of GM soy. The planting of GM soy was legalized in 2003 under the Lula administration, and the country is now the second largest producer and exporter of soybeans in the world, second only to the U.S. Syngenta, which realized profits of over US $8.1 billion in 2005, wields considerable economic and political power in Brazil , and has a strong interest in maintaining its business in the country. Requião's move to expropriate the site from Syngenta will, at the very least, send a message to agribusiness multinationals that they can no longer illegally exploit Brazil's natural resources as they wish, and commit crimes with impunity. It will also no doubt bolster the strength and confidence of the social movements. According to state Via Campesina and MST leader Celso Ribeiro, "for the coordination of the Via Campesina this signifies a huge victory and a grand conquest. Syngenta is the 2nd largest producer of seeds in the world, producing both transgenic corn and soy. Now the site will be used as a center for us to create native and creole seed varieties." Despite the Wine Institute's recent statement that no genetically modified organisms (GMOs) should be used in winemaking, the Sacramento Bee recently reported that, according to American Tartaric Products, the first wines made with a genetically modified wine yeast, ML01, will be released this year. The FDA's designation of this yeast as GRAS (Generally Recognized as Safe) is questionable for a few reasons. First of all, the FDA approved the yeast based on data supplied by the developer, not based on its own study or an independent study. A developer has an interest in getting its product to market as soon as possible, whether it has been proven safe or not. Secondly, according to Professor Joseph Cummins, emeritus genetics professor at the University of Western Ontario, wine yeasts are unstable, and genetically altering them can lead to unexpected toxicity in the final product. He states that there is no evidence that the developer did any animal feeding studies to test for such toxicity and that there is no proof that the yeast and yeast DNA will not be present in the wine. A few wineries' decision to use this yeast could affect the entire North American market. Since these wines are unlabeled, the only way people can avoid them is to avoid all wines from North America, except those labeled organic, and few wines are labeled organic, due to the addition of sulfites during the winemaking process. Consumers in Europe and Asia are very informed regarding GMOs and have resoundingly rejected them. American consumers are becoming more aware, and polls show that a majority of Americans would prefer to avoid them. A few wineries' choice to use ML01 could also be a nuisance to other wineries, because this GM wine yeast could contaminate native and traditional wine yeasts through the air, surface waste and water runoff. Many wineries here in the Napa Valley are very particular about their choice of wine yeast, and contamination of these various yeast strains would truly be a shame. I contacted many of the large producers of Napa Valley wine asking whether or not they have used this GM yeast or plan to in the future. All that responded stated emphatically that they have not used it and do not plan to. To help consumers who would prefer to avoid consuming genetically modified products make an informed wine choice and to provide an avenue for our local wineries to distinguish their wines from wines that may be using GM yeast, those that responded were listed, with their permission, on a "Shopper's Guide to Buying Non-GMO" at www.preservenapasag.org on the FAQs page. In our society, we often talk about our rights and discuss very little our responsibilities - to our neighbors, to the environment and to the community as a whole. In considering the issue of GMOs and their use, all of these factors should be taken into account. Solicita además a los gobiernos de la región a suspender cualquier acción relacionada con la propagación en el ambiente, uso comercial, transporte, utilización, comercialización y producción de papa genéticamente modificada dentro de la jurisdicción de la Comunidad Andina. Pide al Consejo Presidencial Andino establecer un sistema de protección especial para la papa, mediante la recuperación de las variedades tradicionales en lugares donde existe procesos de erosión genética y establecer programas de promoción de dichas variedades. Y por último pide promover la elaboración de leyes nacionales que normen el principio de precaución para casos de pérdida de biodiversidad. La propuesta fue presentada por el Parlamentario Andino Freddy Ehlers. El proyecto de decisión está publicado en la Gaceta Oficial Año 3 No, 12 del Parlamento Andino. La biotecnología se ha puesto en boga y el gobierno de Puerto Rico le apuesta a ella como salida a la debacle económica que sufre el país. Los medios noticiosos publican expresiones provenientes de la academia, la empresa privada y agencias de gobierno al efecto de que esta industria de alta tecnología no sólo salvará nuestra economía sino que también brindará un sinnúmero de beneficios, como la cura para el cáncer y el fin al hambre en el mundo, entre muchos otros. Una vez más nuestro gobierno, en alianza con intereses empresariales locales y extranjeros, se embarca en una ruta de desarrollo económico y tecnológico sin indagar para nada los posibles costos sociales y ecológicos y los impactos a largo plazo. Se repite la misma historia que con el “boom” farmacéutico de las 936, con su saldo de basura tóxica y sitios de Superfondo; las petroquímicas, un sector igualmente tóxico ahora llegado a menos; y la minería a cielo abierto- originalmente propuesta en el plan 2020. Cuando la nanotecnología haya alcanzado un grado de desarrollo suficiente (más bien pronto que tarde) nada será como antes. En los próximos años, nuestras vidas se verán directamente afectadas por una revolución comparable a las tres o cuatro grandes revoluciones técnico-científicas que ha experimentado la humanidad. Pero, ¿en qué consiste esa técnica que nos habla de buckybolas y nanotubos, que nos promete avances inimaginables, entre otros campos, en la medicina, la agricultura, el transporte, las comunicaciones, el medio ambiente, el comercio y, como no, en sofisticadísimos sistemas de devastación para uso militar? La nanotecnología trata con materiales y procesos de una pequeñez apenas concebible, medida en milésimas de millón de metro. A esa escala, materiales tan corrientes como el carbono pueden presentar propiedades desconocidas a una escala mayor. La explotación de las propiedades a nanoescala, como una resistencia enorme, una catálisis mejorada, reacción a la luz, conductividad eléctrica, etc., tiene aplicaciones potenciales en casi todos los aspectos de la vida. Las promesas hechas por algunos son al menos tan grandiosas como las hechas por anteriores profetas de otras nuevas tecnologías y por quienes sacaron partido de ellas. Acabará con el hambre en el mundo. Curará el cáncer. Posibilitará la obtención de energías no contaminantes. Pero la experiencia nos enseña a sospechar que detrás de esas promesas se oculta la degradación medioambiental, el reforzamiento de las relaciones de poder a escala global y la ampliación del abismo que ya separa a los ricos de los pobres. Y sin embargo, existe un potencial enorme para el despliegue de la nanotecnología en formas que pueden comportar beneficios inmensos para los desposeídos del mundo, además de para los consumidores ricos del Norte y para quienes son su avanzadilla entre los pobres del Sur. La cuestión es: ¿quién decidirá en qué se invierten los fondos para la investigación y qué productos y procesos recibirán el visto bueno? 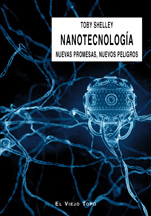 Este libro se propone llamar la atención sobre las áreas en las que se está aplicando la nanotecnología y hacer ver quién controla su desarrollo. Subraya sus potenciales ventajas y examina también algunos de los peligros que puede comportar para los consumidores, los productores, el medio ambiente y nuestra visión del mundo y de nosotros mismos. Es una llamada a la sociedad civil para que tenga en cuenta sus implicaciones, asegure el acceso a sus beneficios, aprenda a desenmascarar sus inconvenientes y exija el control político sobre una tecnología que nos dicen cambiará la faz de la tierra. - Luz Cruz-Flores, Research Manager, Monsanto Caribbean, Puerto Rico. The government of Puerto Rico is wagering on biotechnology as a way out of the economic debacle that the Caribbean island is suffering. Local media frequently quote experts from academia, the business community and government agencies who proclaim that this high tech industry will not only save our economy but also provide countless other benefits, like the cure for cancer and an end to world hunger. Once again, our government, in alliance with local and foreign business interests, rushes down a path of economic and technological development without pausing to ponder the possible social and ecological costs or long term impacts. The story repeats itself. We saw this happen in the late 20th century with the pharmaceutical boom, with its legacy of toxic waste and Superfund sites; petrochemicals, an equally toxic sector that is now an empty shell of what it used to be in the 1970’s; and strip mining, which thankfully never even started. "People concerned about the safety of biotech foods will appreciate that study after study has documented the safety of agricultural crops developed using biotechnology- for both the environment and the dinner table. The most telling fact is that there has not been a single documented case of an illness caused by a food developed with biotechnology since they first came on the market… Crops and food using biotechnology are among the most tested in history and are certified long before they are released onto the market." Such declarations are truly surprising in light of the growing number of prominent scientists that warn that the technology of genetic engineering is based on erroneous and obsolete assumptions and that it therefore presents inherent and unacceptable risks for society and the ecosystem. For starters, interested readers might want to read the work of the Independent Science Panel (www.indsp.org/). This group of some twenty scientists with expertise in agroecology, agronomy, botany, medical chemistry, ecology, microbial ecology, nutritional biochemistry, physiology, toxicology and virology , released a report on GE crops and foods that concluded that “By far the most insidious dangers of genetic engineering may be inherent in the process itself”. We do not pretend that the aforementioned experts have the last word. The biotech industry and its supporters boast their own lists of prominent scientists that wholeheartedly support GMO’s. Our point is that the issue of GMO safety remains an open question among scientists. If biotech foods are as safe and harmless as Cruz-Flores claims, then why the opposition to having them labeled? Monsanto and other GMO seed producers stubbornly oppose labeling, spending large sums of money, engaging in massive lobbying and public relations efforts and even going to the extreme of goading the US to take the matter to the World Trade Organization to this end. Why? Biotech industry spokespeople constantly talk about the need to educate the public in order to quell “unfounded fears” about biotech foods and yet they insist on keeping consumers ignorant about these products. Why? When the subject of labeling was brought up in a biotechnology symposium held by the PR Agricultural Extension Service in 2002, a representative of Dow Agrosciences jumped up from his seat and said “that can’t be done because people will think there is something wrong with the product”. Such is the faith the biotech companies have in the intelligence and criterion of consumers. Such is the faith that they have in the safety of their GMO products. The biotech papaya definitely has had a high economic impact among commercial planters in Hawaii, but in no way can this impact be deemed positive. The GMO papaya, introduced to Hawaii in 1998, was genetically altered to resist ringspot virus, which inflicts substantial damage to the harvest. It must be pointed out that Hawaiian papaya growers were never informed of this, let alone asked for their consent. It was only a matter of time before this biotech product started spreading through pollen and seed dispersal and started to contaminate the fields of papaya growers who did not want GMO's in their farms. GMO Free Hawaii carried out thourough and extensive testing and confirmed that the biotech papaya had spread with no control and polluted countless commercial farms, both conventional and organic. As a result of this genetic contamination, nowadays it is practically impossible to find GMO-free papayas in the islands of Hawaii and Oahu. According to the USDA's own data, in 1995 the Hawaiian papaya harvest exceeded $22 million but today is less than half of that. In 1997, previous to the introduction of biotech papaya, growers were receiving $1.23 per kilogram for their papayas. The following year that figure descended to 89 cents when the major importers, Canada and Japan, refused to buy GMO papaya. The reason for this rejection is simple and plain: consumers do not want biotech foods, and will reject them whenever given a choice. Anyone who doubts it must consider the following fact: Non-GMO commodities always command a higher market price than their non-genetically engineered counterparts. Today the commercial growing of papaya is at its lowest point in decades, in fact right now production levels are lower than in the worst moment of the ringspot epidemic. Since 1998 Americans have doubled their papaya consumption but the land area in Hawaii planted with it has decreased 28% since the introduction of the biotech variety. (For more information: http://www.higean.org/). "The University of Hawaii and the US Department of Agriculture could have agressively educated or required farmers… to chop down and burn all virus infected-trees. The reduction of the virus would have kept the disease at its usual endemic levels… Farmers could also have been advised not to grow in huge plantations, to intercrop, to use soil amendments to grow healthier trees, plant trap-crops for the aphid vector, and spray or spread silicates to block aphid penetration of leaves. The amount of time and money to do this would have been far less than the efforts to force the introduction of the GM papaya." Rivera is right, GMO papaya has had a high economic impact in Hawaii. Why she wishes to extend such an impact to Puerto Rican papaya growers is a complete mystery to us. In her interview with El Nuevo Día, Rivera also praises herbicide resistant GMO crops. As a matter of fact, most of the acreage planted with biotech crops in the world is devoted to Roundup Ready (RR) soy and canola, made by the US-based Monsanto corporation. This type of crop is immune to Roundup, a herbicide made also by Monsanto. Roundup is probably the most profitable and most widely used agrochemical product in the world right now. With RR seed, Monsanto can sell the seed and the herbicide as a single package. Are herbicide-tolerant crops a good idea? One of Monsanto's main rationales for its RR crops is that the Roundup herbicide is allegedly relatively benign for human health and the environment. But such assurances are contradicted by recent findings. An epidemiological study carried out in Ontario, Canada, found that exposure to glyphosate, Roundup’s active ingredient, almost doubles the risk of miscarriages in advanced pregnancies. More recently in France, a team led by Caen University biochemist Gilles-Eric Seralini discovered that human placental cells are very sensitive to Roundup, and that even in very low doses glyphosate can disrupt the endocrine system. According to the Independent Science Panel, "children born to users of glyphosate had elevated neurobehavioral defects. Glyphosate caused retarded development of the foetal skeleton in laboratory rats, (it) inhibits the synthesis of steroids, and is genotoxic in mammals, fish and frogs. Field dose exposure of earthworms caused at least 50% mortality and significant intestinal damage among surviving worms. Roundup caused cell division dysfunction that may be linked to human cancers." Furthermore, in 2005 the UK Royal Society unveiled the results of a four-year study of GE crops. The study, carried out in 266 farm plots all over the country, confirmed that herbicide resistant crops harm wildlife, including wild flowers, bees and butterflies. And on top of all this, there is also the predictable appearance of Roundup-resistant superweeds, a phenomenon that has been documented for at least a full decade. A weed that could resist five times the recommended Roundup dosage was found in Australia in 1996, and in 2000 scientists discovered a herbicide-tolerant canola plant that cross-pollinated with a related weed. That same year, canola weeds resistant to three herbicides, were reported in western Canada. Since then, reports of glyphosate-tolerant weeds have only increased. Naturally, the use of RR seed has multiplied the use of Roundup and this in turn accelerated weed resistance to its active ingredient. The experience with agriculture in the last few decades has made it abundantly clear that weeds and pests develop resistance to poisons they are exposed to with each passing generation. Eventually, more agrochemical poisons must be used to achieve the same effect. When the chemical finally becomes useless, the life sciences corporations "solve" the problem by introducing even more toxic substitutes. In the long run, agrochemical poisons only exacerbate the problems of agriculture and their only beneficiaries are the very corporations that produce and sell them. Instead of promoting the use of herbicides and herbicide-tolerant crops, academia, the public sector and trade associations should promote sustainable alternatives. This would require a rethinking of the very concept of weed. Weeds do not exist in nature, they are defined by social convention. A weed is a useless plant with no economic value. But by what criteria is a plant declared useless and lacking in value? Many of these so-called useless plants are edible. Let's take for example the "useless weed" Portulaca oleracea, a wild plant that grows both in India and Puerto Rico (where it is known as verdolaga). It is a vegetable rich in magnesium, vitamin C and E, vitamin A carotenoids, vitamin B complex, iron, potassium, phosphorus and Omega 3 fatty acids. In fact, many so-called weeds are important sources of vitamin A and are abundant in the tropical countries where vitamin A deficiency is a problem. So instead of sinking hundreds of millions of dollars into products like vitamin A-rich "golden rice", farmers and agronomists would be better off fighting hunger by turning to these wild plants. Many weeds also have powerful medicinal properties, as has been amply documented since the dawn of agriculture and medicine. Take the European herb Plantago major (of the Plantaginaceae family), which also grows in Puerto Rico where it is known as llantén. It is useful as first aid in cases of bee and ant stings, burns, and scorpion and snake bites, and has also been found to be helpful against breast cancer, high blood pressure, conjuctivitis, stomach ulcers and vaginal complications. The aforementioned verdolaga has been used to treat arthritis, burns, insect stings, constipation, plus it's antimicrobial and diuretic. The stunning nutritional and healing properties of these and countless other wild herbs and weeds are a real problem for pharmaceutical and biotechnology corporations that spend billions of dollars (much of it from the public sector) to develop overpriced and often hazardous drugs. Furthermore, many of these wild plants fulfill important agroecological functions, some repel pests, others provide habitat and food for beneficial animals- like pollinators-, fight erosion or even fix nitrogen. But such a rethinking of our relationship with so-called weeds would require us to rethink the prevalent model of industrial agriculture, with its dependence on monocultures, artificial inputs and centralized institutions. Obviously this would not be convenient to agribusiness transnationals and would not be of any interests to the ideologues of the biotech revolution and Puerto Rico's "knowledge economy". Rivera, quite predictably, extolled the use of pest-resistant GMO crops. These crops, known as Bt, secrete an insecticidal bacterial toxin. Bt crops, which today are mostly corn and cotton, are based on three assumptions: 1) that the Bt toxin is inoffensive to humans, 2) that beneficial insects will not be harmed, and 3) that pests will not develop resistance. All three of these have been proven false. Harmless to humans? Since 2004 Norwegian scientist Terje Traavik, of the Institute for Gene Ecology of Tromso University, has reported findings about Bt cornbased on studies carried out in the Phillipines. Traavik documented that populations near fields of Bt corn developed allergy symptoms, which ceased when subjects were removed to areas where no Bt was being planted. With regards to the second assumption, the adverse effects of Bt crops on beneficial insects were known at least as far back as 1999, when research led by John Losey of Cornell University discovered that Bt corn pollen was toxic to monarch butterflies under laboratory conditions. Losey's vociferous critics ignore that subsequent research confirmed that Bt crops indeed are a hazard to "non-target" species. "The potential of Bt toxins moving through insect food chains poses serious implications," warns University of California entomologist Altieri. "Recent evidence shows that the Bt toxin can affect beneficial insect predators that feed on insect pests present on Bt crops... the toxins produced by the Bt plants may be passed on to predators and parasitoids via pollen. No one has analyzed the consequences of such transfers on the myriad of natural enemies that depend on pollen for reproduction and longevity." Research shows that Bt crops adversely affect ladybugs that eat Colorado potato beetles, a major potato pest, and lacewing larvae that fed on pests that were fed Bt corn had a strikingly high mortality rate. Furthermore, the Bt toxin persists in the soil for months, by binding to clay and soil particles. It has been found to persist for as long as 234 days. As for assumption number three, Altieri had warned years ago that, "No serious entomologist questions whether resistance will develop or not. The question is, how fast?". In Makhathini Flats, South Africa, the majority of small-scale farmers that used Bt cotton have stopped planting it because they could not repay their debts. A five-year study by Biowatch South Africa showed most farmers that planted Bt cotton had not benefited. In India, Bt cotton failed huge numbers of farmers in Andhra Pradesh and Madhya Pradesh, many of whom were driven to suicide as a result of heavy debts from purchasing Bt cotton seed, which was 3-4 times the price of conventional cotton. Agrochemical pesticides and Bt crops are founded on erroneous and outdated assumptions about the functioning of agroecosystems. The new schools of ecological thinking that combine modern science with ancient traditional wisdom, which include agroecology and permaculture, hold that a pest is simply an organism whose natural predators have been decimated. Therefore, institutions like the Agriculture Department and university campuses, instead of promoting pesticides and GMO “solutions”, should instead direct their efforts toward the restoration of predator species that are natural allies of agriculture. For example, in Puerto Rico one of the worst agricultural pests is the rat, and it is a well known fact that local animal species like the múcaro (screeching owl/ Megascops nudipes), guaraguao (red-tailed hawk/ Buteo jamaicensis) and the Puerto Rican boa (Epicrates inornatus) are a natural form of rodent control. And there are also species of bats and birds that feed on pests and make the use of pesticides unnecessary. As is the case with weeds, rethinking our relationship with pests along ecological lines is not compatible with the prevalent agricultural model or with the profit interests of transnational corporations that sell poisonous agrochemicals and biotech seeds whose need and safety remain unproven. Some academics, agronomists and agribusinessmen, who remain set in the ways of conventional agriculture, will consider the statements against chemicals and GMO’s and in favor of a new relationship between agricultura and ecology to be ridiculous. But what is really ridiculous is to continue, like sleepwalkers, down the path of conventional industrial agriculture, which is not only ecologically suicidal, but is also socially backward and adverse to the interests of consumers. Biotech corporation spokespeople go on about their good intentions toward farmers. But the biggest problem of Puerto Rican farmers face (and for that matter, agriculture in many other places) is the pitiful sums of money that they get paid for their product. This problem, which is not technical in nature but economic and political, will not be solved by the Monsantos of the world, and in any case they have no interest in solving it. Unfortunately, academia, trade associations and government agencies seem more interested in looking after the interests of agribusiness corporations than after those of the farmers. The move toward an agriculture that is ecologically sound and fair to the farmer and consumer cannot count on the government or major corporations, since they are committed to the pompously named "knowledge economy", which includes as an essential component the roughshod introduction of GMO products. The initiative belongs to farmers (especially small ones), conscious consumers, environmentalists, committed academicians and scientists and many other sectors which may not have money but have more than enough brawn and guts. Carmelo Ruiz-Marrero is an author, environmental journalist and director of the Puerto Rico Project on Biosafety. He is a fellow of the Oakland Institute (oaklandinstitute.org) and Senior Fellow of the Environmental Leadership Program (elpnet.org). Altieri, M. "Genetic Engineering in Agriculture: The Myths, Environmental Risks, and Alternatives" (Segunda edición). Food First Books, 2004. Benedetti, María. "Bendiciones Botánicas para Boriquén". Verde Luz, 1999. Bondera, Melanie. "Hawaiian Papaya: Market Loss and Contamination". Reciba un cálido saludo. El Proyecto de Bioseguridad de Puerto Rico, establecido en el 2004 y registrado en el 2005 como organización sin fines de lucro en el Departamento de Estado de Puerto Rico, solicita de su generosidad y apoyo para continuar nuestro trabajo educativo sobre las implicaciones éticas, ecológicas, políticas, económicas y de salud pública de los cultivos y productos genéticamente alterados, también llamados transgénicos. Estamos seguros que ya usted conoce de nuestra trayectoria de trabajo en la investigación y educación sobre el tema de los transgénicos, y sobre una amplia gama de temas relacionados a la agricultura, nuestra alimentación, la ecología, la globalización y los impactos de las nuevas tecnologías; al igual que la promoción de alternativas positivas que nos encaminan hacia un futuro ecológicamente sustentable y próspero. Al momento nuestra labor gira alrededor del libro "Balada Transgénica: Biotecnología, Globalización y el Choque de Paradigmas". El libro, de la autoría de Carmelo Ruiz Marrero y publicado por nuestra organización, ha sido todo un éxito en ventas. Desde su lanzamiento en octubre de 2005 se ha vendido la tirada entera de 1,240 ejemplares ¡Y la demanda no para! Afortunadamente en estos momentos aún quedan copias en la Librería Norberto González y en Borders. del Turabo y los recintos de la UPR de Mayagüez y Aguadilla, lo han adoptado como libro de texto, y confiamos que así lo hagan otras instituciones educativas. Desde luego tenemos intención de reimprimir el libro, y estamos en el proceso de solicitar cotizaciones de impresores puertorriqueños. Sin embargo es un costo que no podemos sufragar, a pesar de la buena acogida los ingresos no son suficientes para poder costear la impresión. Además, se nos hace necesaria la adquisición de una computadora para así poder utilizar al máximo las capacidades de la internet como herramienta de educación y difusión (audio y video) y desarrollar presentaciones multimediáticas (Powerpoint, etc.). Los cheques deben estar dirigidos al PROYECTO DE BIOSEGURIDAD DE PUERTO RICO. Aprovechamos para compartir con usted algunos de los logros del Proyecto de Bioseguridad de Puerto Rico, para que esté informado sobre el trabajo que realizamos. * Octubre del 2005 al presente- Distribución y promoción del libro "Balada Transgénica: Biotecnología, Globalización y el Choque de Paradigmas". El libro es la herramienta para la difusión amplia de la problemática de los transgénicos, así como el dar a conocer el trabajo de nuestra organización. * El Proyecto de Bioseguridad, ha participado activamente en más de una decena de emisoras de radio: Radio Universidad, Radio Isla, Radio Puerto Rico, Noti-Uno, Radio Atenas, WPRA, Radio Turabo, WPAB, WAEL, Radio OSO, WKVM, WKAQ Radio Reloj, y en la prestigiosa emisora europea Radio Nederland. * El Proyecto de Bioseguridad ha presentado el libro u ofrecido charlas en los recintos de la UPR de Ponce, Río Piedras, Mayagüez, Cayey y Aguadilla, la Librería Mágica, la Universidad del Turabo, Librería Paliques (Ponce), Borders (Mayagüez y Plaza las Américas), librería Norberto González, Así Que Sí (Cabo Rojo), la Escuela de Derecho y el recinto metropolitano de la Universidad Interamericana, el Centro Cultural Juan Antonio Corretjer (Chicago), la Universidad de DePaul (también en Chicago), Bates College (Maine) y en muchísimos lugares más. Presentamos el libro en actividades en Orocovis, Rincón, Lajas, Santa Isabel, Trujillo Alto, Hormigueros, San Germán, Arecibo y el barrio Tenerías de Ponce. De particular importancia fueron las presentaciones en la Escuela de Ciencias Agrícolas del Recinto Universitario de Mayagüez, la Estación Experimental Agrícola (Gracias al amigo Edwin Abreu), la ciudad de Albany (estado de Nueva York) y la Escuela de Salud Pública de la Universidad de Harvard (gracias al profesor Richard Levins). * Transmitir un programa radial por internet, lo que en el argot cibernético se conoce como un podcast. Este será en el 2007 nuestra plataforma principal para difundir nuestro mensaje no sólo en la isla sino por el mundo entero de habla hispana. Nuestro podcast será un foro de ecopolítica y música independiente, educativo y ameno, dedicado a asuntos de actualidad como los transgénicos y la problemática ambiental al igual que a nuevas expresiones artísticas. * Aportar de manera significativa a alternativas sustentables y a iniciativas positivas en los ámbitos de la ecología, alimentación, agricultura y las artes, con vías a construir el Puerto Rico que todos queremos. On the surface all appears quiet in West Africa when it comes to GM (genetically modified) crops. Yet, under the surface, the pressure on governments, researchers and farmers' organisations to accept GM crops is huge. And in reaction resistance is building up, both within each country and also in a large network of activists and farmers across Africa. A polarised battle looms. The Environmental Rights Action/Friends of the Earth, Nigeria (ERA/FoEN) organised a regional conference on Biosafety in Abuja, Nigeria from November 27 to 29th, 2006. The theme of the conference was "African Biosafety Response." The conference ,which was attended by NGO representatives from Nigeria, Ghana, Sierra Leone, Togo and Cameroun as well as international scientists, academics, officials of Nigerian government agencies and ministries, farmers' bodies, lawyers, journalists and students, deliberated on biosafety challenges facing the continent..
* All African must initiate proactive programmes to promote local rice varieties, reduce import dependency and promote food sovereignty. * African governments make adequate provision for the development of personnel and infrastructure for biosafety regulation and control. En México los servicios ambientales han resultado ser la nueva estrategia para desplazar a las comunidades campesinas de sus territorios. Desde las nuevas "caras" de la privatización del agua y la contaminación transgénica del maíz a la imposición de monocultivos forestales de especies exóticas, los "servicios ambientales" no hacen otra cosa que ocultar "una estrategia más del capital para expulsar a la gente de las comunidades indígenas" según afirma Aldo González. Biodiversidad entrevistó al indígena mexicano de Oaxaca, quién habló del agua, la tierra y las semillas así como de las prácticas tradicionales de indígenas y campesinos, que siguen conformando una fuerte resistencia a la mercantilización de los bienes comunes. "With this decision, USDA is telling agricultural biotechnology companies that it doesn t matter if you re negligent, if you break the rules, if you contaminate the food supply with untested genetically engineered crops, we'll bail you out," said Joseph Mendelson, Legal Director of the Center for Food Safety. "In effect, USDA is sanctioning an 'approval-by-contamination' policy that can only increase the likelihood of untested genetically engineered crops entering the food supply in the future, and further erode trust in the wholesomeness of U.S. food overseas," he added. "Experimental, genetically engineered crops like LL601 are prohibited for a reason," said Bill Freese, Science Policy Analyst at Center for Food Safety. "Exhaustive testing is required to determine whether or not mutagenic gene-splicing procedures create human health or environmental hazards, and no one has done that analysis on LL601 rice," he added. In comments filed with USDA, the Center for Food Safety (CFS) opposed USDA's consideration of Bayer's petition for market approval of LL601 as an abuse of the regulatory process. CFS also blasted USDA for allowing Bayer to black out extensive portions of its petition as "confidential business information," and demanded that it be released for public scrutiny and comment before any decision was made. CFS further noted that Bayer might exploit the approval to evade liability for an estimated $150 million in market losses suffered by U.S. farmers because of the episode. LL601 is one of several 'LibertyLink' (LL) rice varieties that have been genetically engineered by Bayer to survive application of Bayer s proprietary Liberty© herbicide. Liberty kills normal rice, but can be applied directly to LL varieties to kill surrounding weeds. This explains why Bayer had to obtain government approval to permit residues of the weedkiller on rice grains of its two approved versions of LibertyLink rice. "Contrary to what you hear from the biotech industry, genetically engineered crops like LibertyLink rice mean more chemicals in our food, not less," said Freese. "USDA's decision to approve genetically engineered rice that Bayer itself decided was unfit for commerce is the clearest sign yet that U.S. authorities are intent upon dismantling federal regulation of genetically engineered crops in the interests of the biotechnology industry," said Mendelson. "Center for Food Safety will consider all legal options to put an end to USDA's 'approval-by-contamination' policy for new genetically engineered crops," he added.